Nestled in a little cubby hole-sized piece of Pike Place Market is the Market Grill, one of our favorite stops for fresh-out-of-the-water salmon sandwiches. 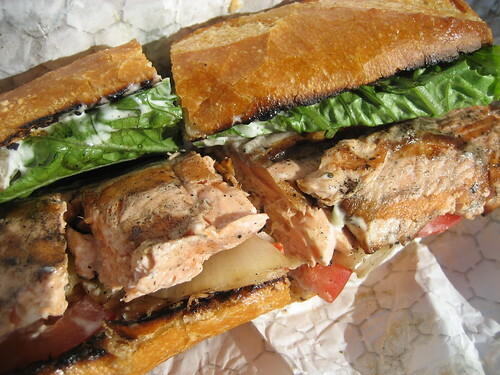 Grilled to perfection, the salmon (or halibut or shrimp) is generously packed into a toasted baguette along with lettuce, tomato, grilled onions and a tasty rosemary mayo. These sandwiches are so good locals will even brave the cruise ship crowds to get one! This sandwich sounds wonderful! I have a great recipe that I use at home to get that same amazing taste without traveling all the way to Pikes Place Market! Enjoy! 1. Open each roll and spread a generous amount of dill dip on each half. 2. Place lettuce on each bottom half and cover with onions and tomatoes. 3. Lay piece of salmon on each sandwich and garnish with capers. Enjoy! Sounds like a great sandwich Morgan, hope you could add it up in Foodista's recipes too! This post really made me hungry! Can't wait to get to PPM again! Maybe we will have to make the trek as soon as the mountain passes are open :) This sandwich looks divine! OH fishy heaven! I was just in Seattle (and the markets) last July and missed this little gem...YUM! Oh how I miss the PPM. My ex used to go to school at UW and I spend many hours at the market while he was in class! Sammie looks great! Grilled salmon and rosemary mayo! Can we have one please? I love this place! Been coming here for over 12 years and I still consider it my little secret (although of course it's not). I am always amazed when I suggest this place to Seattle natives who've never been. Make sure to get the grilled onions! Also a personal favorite! I used to work near the market and got a fish sandwich at this place at least once a week!